I’m sure most of you, even beginners, have heard of the crocheting go-to stitch ‘Shell Stitch’ (see a version of it here: Stitches for your Crocheting Arsenal: Part Two) The scallop stitch is very similar, but usually involves more stitches within each ‘scallop’ and each scallop occupies a larger number of spaces. I recently saw a very old scrap afghan at a garage sale using a stitch similar to this one. I spotted from nearly a block away! Rows 3 and 4: Color D, with the sequence repeating until finished. Row 5: ch 3, 1 dc in first sc, ch 1, *sc between next two dc, ch 5, skip 5 dc, sc between last skipped dc and next dc, ch 1, (dc, ch 1, dc) in next sc, ch 1, repeat from *across, ending with sc between the first and second dc of last 3 dc, ch 2, 1 dc in beginning ch. Repeat rows 2–5 until appropriate length is reached. This entry was posted on Saturday, December 11th, 2010 at 12:00 AM by Erin Burger	and is filed under Free Crochet Patterns, Tutorials and Help. You can follow any responses to this entry through the RSS 2.0 feed. You can leave a response, or trackback from your own site. I am having problems with changing color. I am making an afgan in the granny stich and when changing the color from dark blue to white for accent, I know how to change the color, it’s what do I do with one or the other color when not in use? Do I carry the color up each round or drop it? My work just doesn’t look right. Please help. 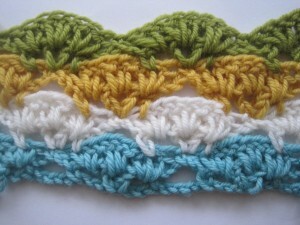 Check out http://www.crochetspot.com/how-to-change-colors-in-crochet/ for some information on how to change colors. Hopefully that will help!